1. Adsorption chromatography in which the components of mixture are selectively adsorbed on the surface of packing column material i.e. adsorbent. 2. Partition chromatography in which component is partitioned between the mobile phase and their stationary phase is held stationary on inert solid support. 3. Ion exchange chromatography in which the constituent of sample is selectively retained by exchange resin by replacing ion/s on packing material. 5. Affinity chromatography utilizes the specificity of a enzyme for its substrate or substrate analogue for the enzyme’s separation. We will discuss in details all these types of chromatogrpahic techniques. 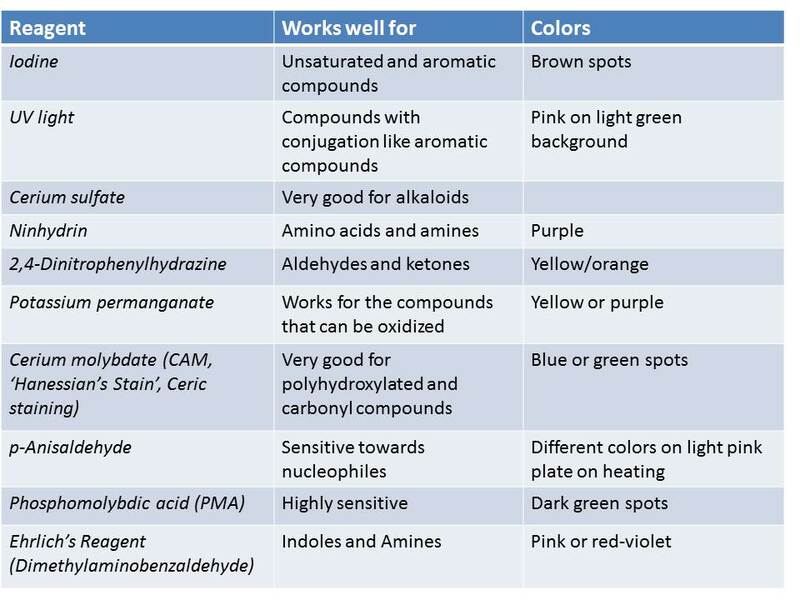 But for now, lets understand that all these chromatographic techniques have a lot of features in common. So, lets discuss what all they share in common. The columns are usually made up of glass or polyacrylate plastic. They all are different in dimensions and range from 2 mm in diameter to 70 mm in diameter and lengths vary from 15 cm to 150 cm. The choice of the column is determined by the amount or the volume of the sample. The commonly used glass column shave a sintered glass disc at the bottom to support the stationary phase. Another affordable alternative is the use of a plug of glass wool with a small amount of quartz sand and glass beads. Some columns might get affected by the temperature and hence, for such techniques, the columns with thermostat jackets are used. All the columns are provided with an inlet and an outlet. The column is held in the upright position and as already mentioned above, the bottom is sealed with glass wool or other such supports and the outlet is closed. Now, the mobile phase is added into the column so that 1/3rd is filled with it. Next, the stationary phase in the form of slurry i.e., degassed gel or adsorbent or resin is gently poured in the column. The slurry is added such that the 3/4th of the column is full. The outlet is now opened and the column is stabilized by adding the mobile phase. Note that a nylon disk is placed on the top of the column so as to prevent the disturbance of the column by the addition of the mobile phase or by the addition of the sample. The addition of the sample is a critical step as it should not disturb the column. Also, the sample should be added in a less volume and the sample should be desalted so as to avoid anomalous adsorption effects. The sample is mixed with sucrose or ficoll to 1% concentration so as to increase the density of the sample. This sample now sinks below the top layer of the solvent to the surface of the column. Bromophenol blue dye can also be added in place of sucrose which will help in tracking as well. Alternate method of sample addition is to reach the column surface directly with the help of the syringe or capillary tubing. Isocratic elution: When there is a single solvent acting as an eluant during development, then, this type of process is called isocratic elution. Gradient elution: However, sometimes, single solvent elution may not be sufficient as the resolution may not be satisfactory. So, in such cases, pH or ionic strength or polarity of the eluant is changed w.r.t. time. This leads to the formation of gradient in the column which leads to a better resolution of the sample components. So, this process where the composition of the mobile phase is changed thereby giving rise to the gradient is called gradient elution. This was about the basics of the column chromatography. From next posts on, we will discuss the types of column chromatography in details. As discussed in earlier post, there are two types of plane chromatography. 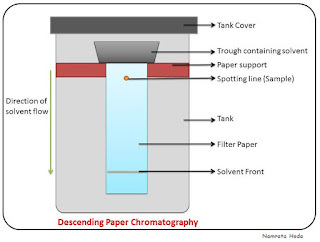 We have discussed Paper Chromatography in details in the earlier post. 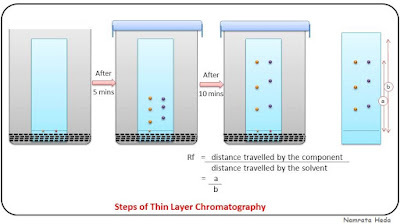 In this post, we are going to discuss about Thin Layer Chromatography. 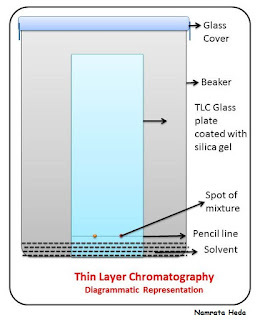 Thin Layer Chromatography, abbreviated as TLC, is a type of plane chromatography which is used to separate non-volatile mixtures. Just like all chromatographic procedures have a stationary phase and a mobile phase, TLC also posses the same. In case of TLC, the stationary phase normally consists of a finely divided adsorbent, generally, silica (SiO2) or alumina (Al2O3) powder. This adsorbent is used in the form of a thin layer (around 0.25mm) on a supporting material (which is usually the glass plate, polyester or aluminium sheet). Also, a binder like gypsum (chemically, calcium sulphate) is mixed into the stationary phase so that it sticks better to the supporting material. At times, the stationary phase also often contains a substance which fluoresces under short UV (254nm) which is used in later stage for visualizing. The mobile phase consists of an organic solvent or a mixture of solvents. The sample containing the mixture of components/compounds is applied onto the stationary phase i.e. ; on the adsorbent as a small spot. 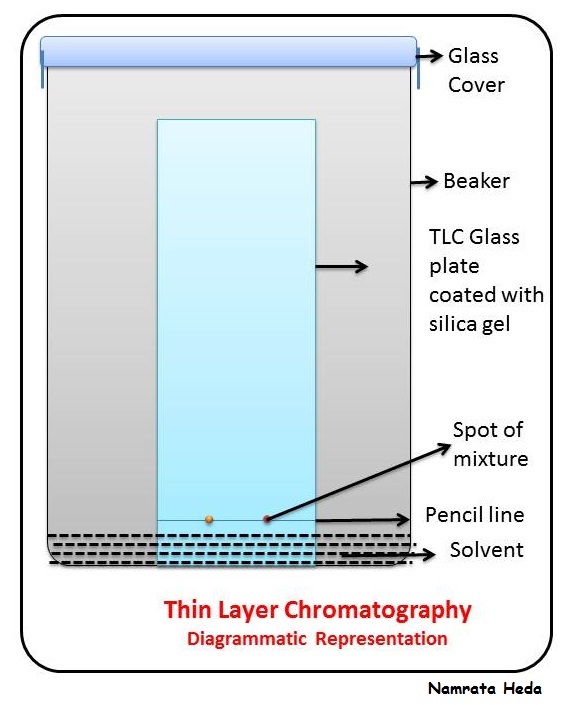 This TLC plate is then placed vertically in a closed container with its edge having the sample spot placing down touching the solvent as shown in the diagram. The solvent which is in the bottom of the container travels up the layer of the adsorbent by capillary action. It passes over the sample spot and it continues to move up and moves the compounds of the mixture up the plate at different rates, thereby resulting in the separation of the compounds. If the compound is soluble in the mobile phase (solvent), it will travel up the TLC plate. If the compound is not soluble in the mobile phase, it gets adsorbed on the stationary phase meaning, it will stick to it and will not move much far on the TLC plate. 1. Spotting the sample: The sample, containing a mixture of compounds, which is to be analysed is dissolved in a suitable volatile solvent to produce a very dilute solution. A pencil line can be drawn near the bottom (around 1 cm from bottom) of the plate where the sample will be placed. (Remember, not to use the pen while marking, as the dye from the ink will interfere with the separation of the components and give erroneous results). Using a micro-pipette, a small amount of the sample is then transferred at the point marked on the TLC plate. The spotting solvent evaporates quickly leaving behind a small spot. 2. Development: Once the spot is dried, the TLC plate is placed vertically into an air-tight jar containing the solvent, to a depth less than 1 cm (so as, not to soak the sample spot point). The solvent now travels up the plate and tries to take the components of the sample along with it. As the solvent travels up, over the spot, equilibrium is set up as the solvent and TLC plate (silica coating) competes for the components of the sample. The silica gel binds to the solute and the solvent tries to dissolve it away from the sample spot as the solvent travels up the plate. The result as how much the components will travel will depend on the polarity of the three components – polarity of the plate, the polarity of the development solvent and the polarity of the components in the spotting sample. If the solvent is polar enough, the components of the sample will move some distance with the solvent from its original location. Different components will have different polarities and hence will move at different distances from original spotting location and will appear as different spots. When the solvent has traveled almost to the top of the plate, the plate is removed and solvent front is marked with the pencil and solvent is allowed to evaporate. Lets try to understand how the development is taking place at the molecular level. 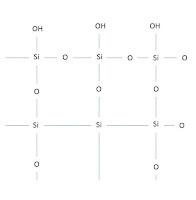 It has a network of thousands of alternating silicon and oxygen bonds with hydroxide (O-H) groups on the outside surface. So, this structure is highly polar and is capable of hydrogen bonding. As the solvent travels up over the spot, there is a balance of inter-molecular forces which helps in determining the position of equilibrium and thus the ability of the solvent to move the components of the sample up the plate. 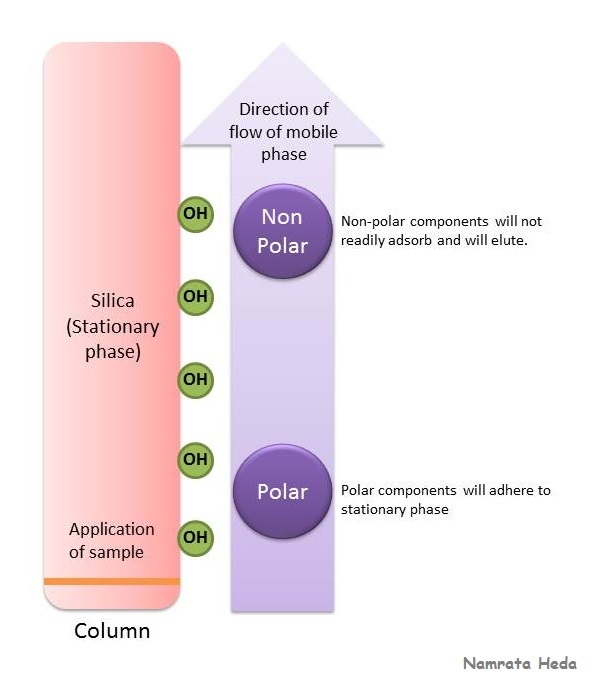 For example, if the sample has two components, then the more polar will tend to stick more tightly to the plate as the O-H bonds of the silica gel, being polar will bind with the polar components of the sample more tightly while the less polar will move along with the solvent. The components visible as separated spots can be analyzed by comparing the distance traveled by the component to that of the reference values. As mentioned, once the solvent reaches the top, the plate is removed and the distance traveled by the solvent and the distance traveled by the component is measured. Then, Rf value is calculated as shown for one component in the above diagram "steps of chromatography"
TLC is simple to use and is inexpensive. The solvents for the TLC plate can easily be changed and it is possible to use different solvents. 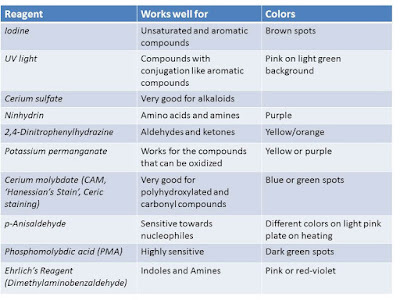 Purity of the compound can be ensured by using TLC. The purity can be checked by using UV-light. They do not have long stationary phases. Thus, the length of separation is limited compared to other chromatographic technique. It operates in a somewhat open system, so factors like moisture and temperature can interfere with the separation process thereby affecting the chromatogram. We have seen in our previous post that any chromatographic technique consists of a stationary phase and a mobile phase. In the case of paper chromatography, which is one of the type of plane chromatography, paper acts as a stationary phase while the mobile phase generally consists of a mixture of water and an organic liquid. 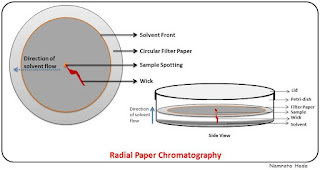 Lets understand the principle and types of paper chromatography. The sample is spotted on the filter paper at the base line or the spotting line. This filter paper is then placed in the suitable solvent. When the solvent rises up via the capillary action, the individual components in the sample get separated. Different components travel at different rates and the most soluble substance move further on the filter paper than the least soluble substance. The solvent travels the farthest on the filter paper and it leaves the line called as ‘solvent front’. Okay, the components got separated, but now, the question is, how to identify the components of the mixture? 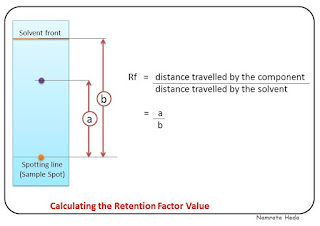 The answer to this is by calculating the retention factor or the Rf value. The distance traveled by a particular component is constant relative to the solvent as long as all other factors (like, the type of paper and the exact composition of the solvent) are kept constant . 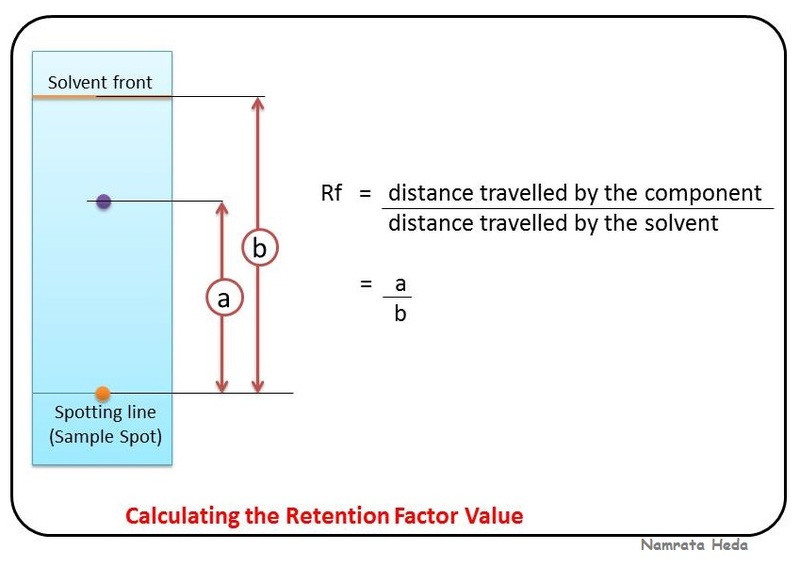 Rf is the distance moved by the component divided by the distance traveled up the paper by the solvent as can be seen in the adjacent diagram. For example, if the component traveled 5 cm (distance 'a' in the adjacent diagram) and the solvent traveled 15 cm (distance 'b' in the adjacent diagram), then the Rf value of that particular component will be 5/15 or (a/b) i.e., (distance traveled by paper/distance traveled by the solvent) = 0.3. The filter paper is put into an airtight tank containing the solvent (solvent tank). The paper is supported on a frame or on the thread with the help of the clips. This is carried out in an air-tight container lined with paper and saturated with solvent so that there is a constant atmosphere and the separation takes place in constant temperature. 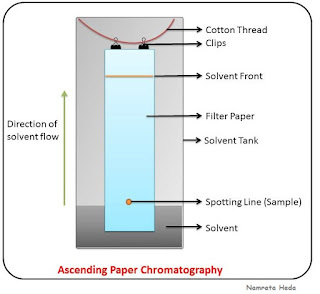 Here, the solvent will ascend into the paper via the capillary action i.e., the solvent will travel in the upward direction of the chromatographic paper. The substance which is the most polar will be at the bottom of the tank while the least polar substance will be on the top end of the tank. 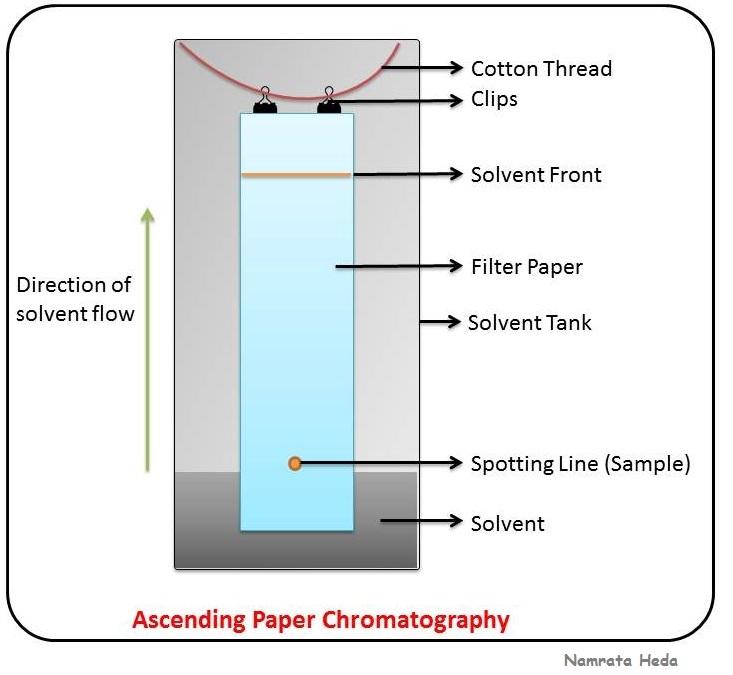 In descending type paper chromatography, the upper end of the filter paper is put into the solvent mixture contained in a narrow trough. This paper is mounted near the top of the container. This develops along with gravity which makes this technique little quick and easy. In contrast to the ascending technique, the substance which is the most polar will be at the top of the tank while the least polar substance will be on the bottom of the tank. In this type of chromatography, there is a circular paper. The sample is placed at the center of the paper. This paper is tied parallel (in a horizontal way) to the petri-plate which contains the solvent (As can be seen in the 'side view' diagram). There is a wick of the paper and this wick is dipped inside the solvent. As a result, the solvent rises through the wick via capillary action and the components get separated in a circular zone. In this technique, a square or a rectangular paper is used. The first step is to perform an ascending type where the sample is placed at the bottom corner (say, right corner) of the paper saturated with and dipped in the solvent. After few hours, the paper is turned at a right angle, 90degree, clockwise, to the direction of first run with a different solvent. This was all about different techniques of paper chromatography. 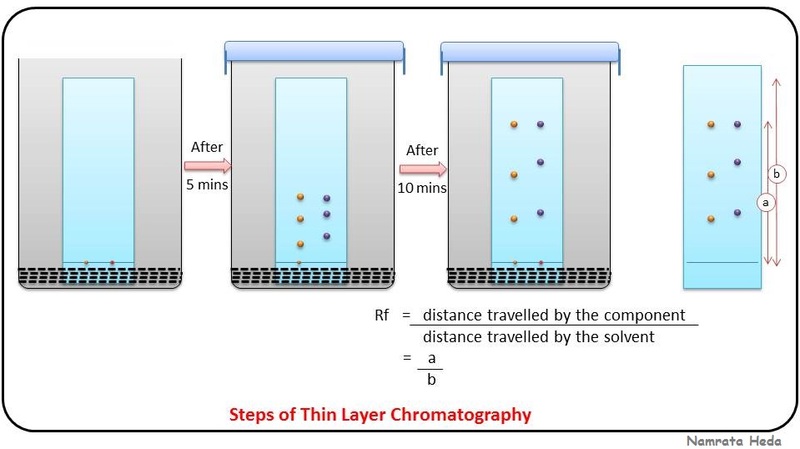 In the next post, we will discuss about anohter method of plane chromatography which is thin layer chromatogrpahy. 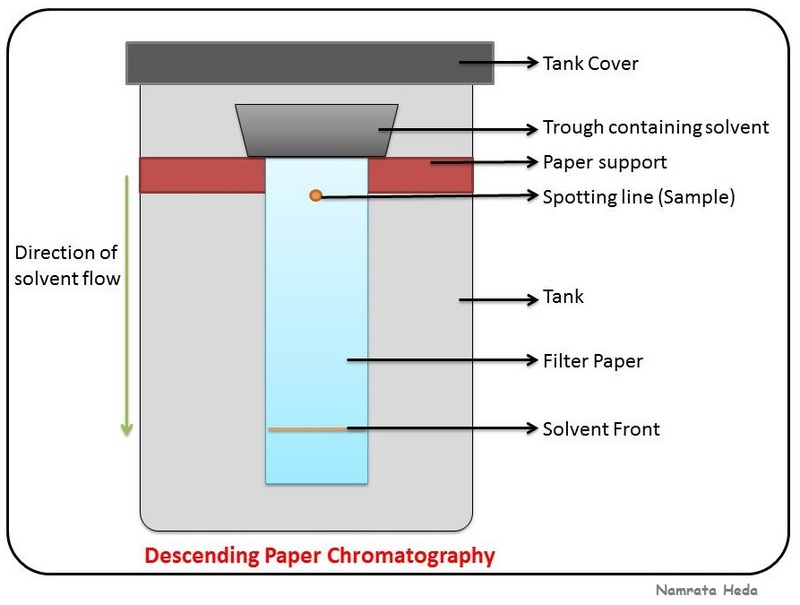 Chromatography is a technique of separating or analyzing complex mixtures. Now, the question asked is, what is so special about chromatography? Well, chromatography can separate the components from the mixture with acute precision. For example, some proteins, which vary by a single amino acid, can also be separated by the chromatography technique. Also, the conditions employed in chromatography are not severe and for this reason, chromatography can be used when one needs to separate delicate products. The inventor of chromatography is Michel Tswett who was the Russian biochemist. In 1906, he separated chlorophyll from the plant pigments mixture. In this mixture of pigments, each band had a distinct color and so the procedure was named ‘chromatography’ where ‘chromo’ means colour while ‘graphy’ means to write. Before understanding the principle, first lets get familiarized with frequently used terms in chromatography. In all chromatography, there are two phases – a stationary phase and a mobile phase. The mobile phase can be either a liquid or a gas while the stationary phase can be either a solid or a liquid. The analyte is composed of different components that need to be separated. So, the mobile phase (solvent) is made to flow through the stationary phase (like, silica bed). 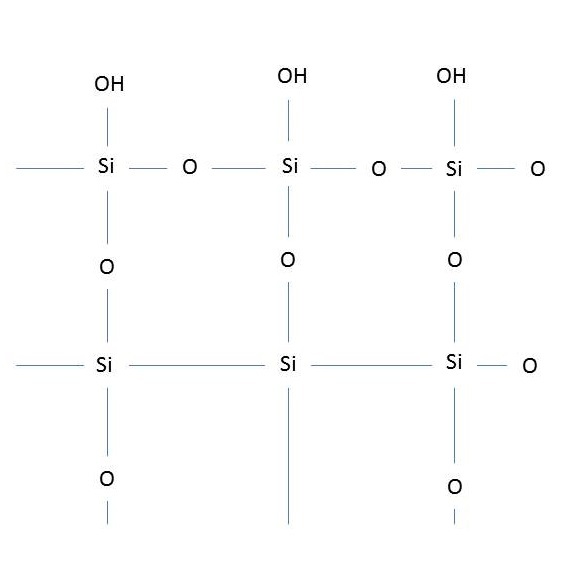 The components of analyte show different degrees of adhesion to silica. The components that adhere to the stationary phase more strongly, travel slowly as compared to those components who have a weaker adhesion. Thus, we can say that, when an analyte or mixture of components is introduced into the column (narrow zone), then, the different components move at different rates in the direction of solvent (mobile phase) flow. Now, lets ask ourselves certain questions. (a) What decides the separation of the the components in the analyte? The basic principle behind the separation is that the affinities of the components of the analyte is different towards the mobile phase and the stationary phase. The smaller the affinity the component has for the stationary phase, the shorter the time it will spend in the column. (b) What decides the affinity? Adsorption: Adsorption is the property as to how firmly a component sticks to the stationary phase. So, the higher the adsorption, the slower the molecule will move through the column. Solubility: Solubility is the property as to how well a component of the analyte can get dissolved in the mobile phase. The higher the solubility in the mobile phase, the faster the molecule will move through the column. Note: Adsorption and solubility of a molecule can be changed by choosing the appropriate stationary and mobile phases. (c) Why different components have different affinity towards stationary and mobile phase? The answer to this question lies in ‘polarity’. 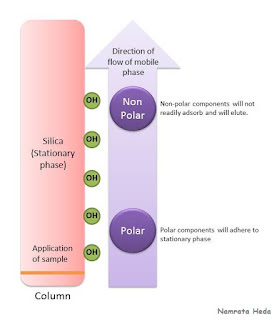 The component that is polar in nature, will adsorb on the polar stationary phase (say silica), while the components which are non-polar in nature, will readily dissolve in the non-polar mobile phase without adhering to the stationary phase and will elute from the column as can be seen in the adjacent diagram. Keeping all these basics in mind, we will discuss in the next few posts, the above mentioned different types of chromatography. In the previous post, we have discussed about crop and its types. 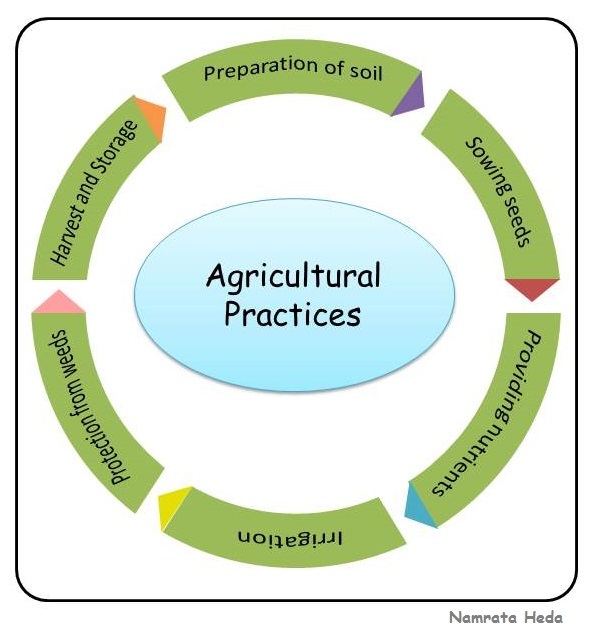 In this post, we will have a look at the different agricultural practices. Of these, we will discuss first four practices in this post while harvesting, protection and storage will be discussed in the next post. Plough: It is made up of wood. There is a triangular iron strip, called as ploughshare while the long log of wood is called the ploughshaft. Hoe: It is a tool with a long handle and a broad metal blade at one end and is mainly used for removing weeds. Some use it to loosen soil as well. Cultivator: It is a large farm machine driven by a tractor which is used to loosen the soil in the modern agricultural method. Leveling is the process where the big mud pieces called crumbs are broken down with the help of leveller. Leveller is used to level the soil for preventing it from getting eroded by the wind and also helps in retaining the moisture. Leveling is also important for properly sowing the seeds and for irrigation purposes. Seeds should undergo fungicide treatment to prevent seed-borne diseases. Seeds should have enough amount of water for its germination as seeds do not germinate in dry soil. Note: Damaged seeds are hollow and can be identified by soaking in water. Being hollow (light-weighted), they will float, while the healthy seeds will shrink. By traditional method - The traditional method uses a tool which is funnel-shaped. The seed passes through the funnel and the funnel end pierces into the soil thereby placing the seeds there. By a seed drill - Seed drill is the modern day equipment is where the seeds are sown with the help of tractors. 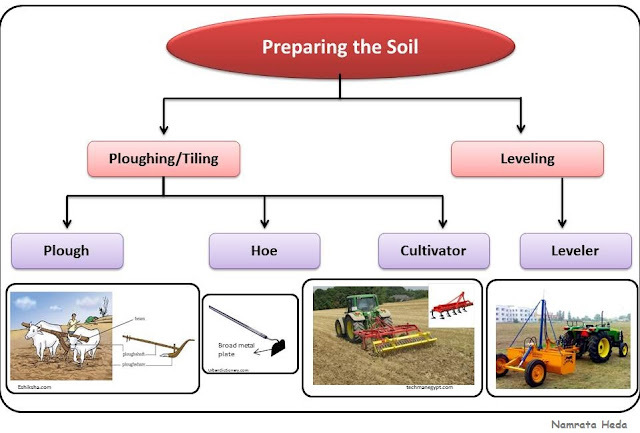 Seed drills are considered to be better as the seeds are sown at equal distance and depth. After sowing, the seeds are covered with the soil thereby preventing the damage done by the birds. Also, it saves time and labour. B. Transplanting: In this case, the young plants are developed in the nursery bed and the seedlings are transferred to the field ensuring that there is proper spacing. It is mainly done in case of paddy crop and bananas. Mixed cropping: It is also called as multiple cropping. 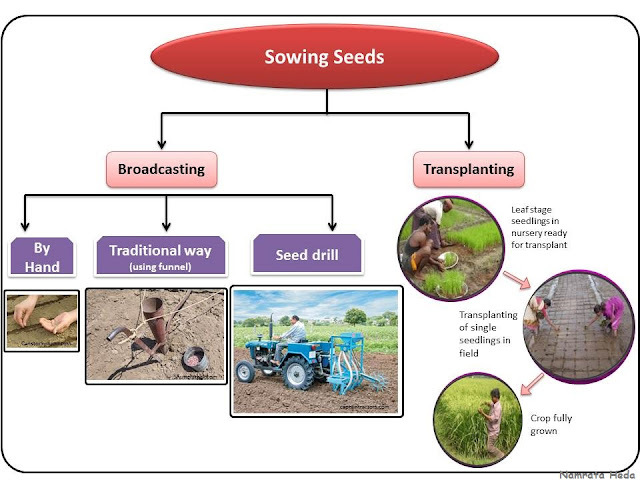 This is the practice where two different crops or more are grown simultaneously in the same field. The crops are chosen in such a way that the products and waste material from one crop helps in the growth of the other. 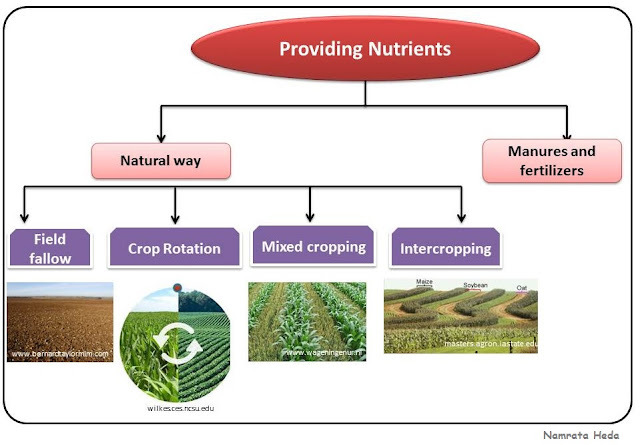 This type of cropping leads to improving the fertility of the soil thereby increasing the crop yield. Generally, one crop is of long duration while the other is of short duration. One crop requires more nutrients and water while the other requires lesser nutrients or water. As a result, there is a reduction in the competition between the crops for light, nutrients and water. If one crop fails to grow (due to untimely rain or no rains or shortage of nutrients), then the other crop can cover the risk of this complete failure. Crop rotation: Here, different crops are grown alternately on the same land. For example, legumes are alternately grown with wheat. In one season, legumes are grown as fodder which also helps in replenishing the soil with nitrogen. After this, the wheat crop is then grown. It is a good method of replenishing the soil naturally. Intercropping: this is the process of growing two or more crops together in proximity on the same land. As a result, two or more crops are managed at the same time in a definite pattern. This increases the productivity per area and soil erosion is reduced. Field fallow: In this process, the field is left uncultivated for a season or two. This is help in regeneration of the lost nutrients. But it results in the wasting the land for a season and due to high demand these days, this method is no longer used. B. 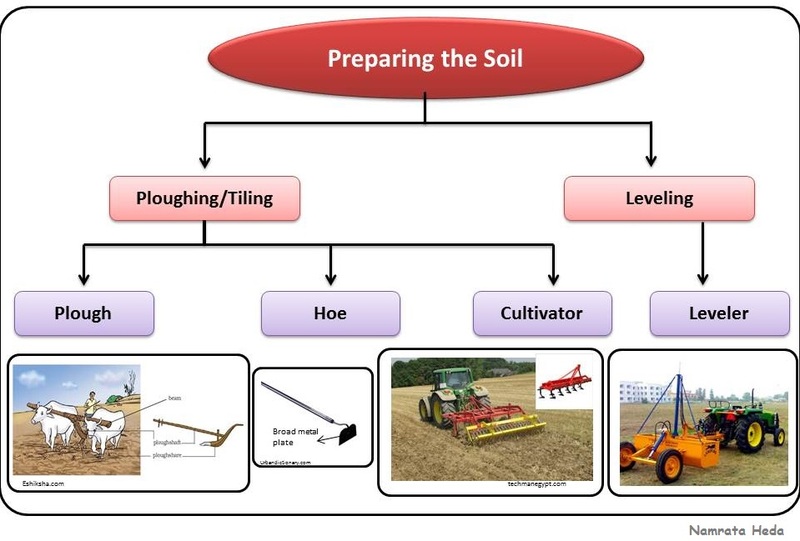 Adding manures and fertilizers: Manures and fertilizers are the substances which are added to the soil in the form of nutrients in order to make the soil more fertile for the healthy growth of the plants. Manure is natural organic substances which are produced by the decomposition of cow dung and other animal wastes and plant residues while the fertilizers are chemical inorganic substances which are rich in specific nutrients. Farm yard manure – This type of manure consists of dung, urine, leaves and other farmyard wastes. Compost – This type of manure is obtained by the decomposition of dead plants and animal wastes, sewage waste etc. All the organic material is buried in a pit with alternative layers of soil and is allowed to rot. Green manure – This type of manure is formed by the decomposition of the leguminous plants like sunhemp and guar. These plants are grown and are sown back into the same soil. Improves the texture of the soil as being organic in nature, adds to the fertility of the soil. Increases the number of friendly organisms like bacteria, earthworms etc. Water gets absorbed by the roots of the plants and along with water, several nutrients and fertilizers also get absorbed which are then transported to various parts of the plants. Water is necessary for the germination of the seeds. Water protects the crop from hot-air currents as well as from the frost. Chain pump: It consists of two large wheels of which the bottom wheel is half immersed in water source and both the wheels are connected by an endless chain. When the wheel turns, the connected bucket dips into the water source and collects the water. 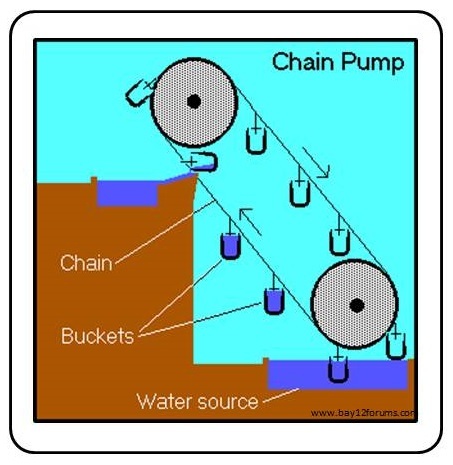 The chain then lifts them to the upper wheel, where water from the bucket is transferred to the pool where it gets collected. The chain then again carries the empty buckets back down to be refilled and this cycle continues. Moat system of irrigation – It is also called as pulley system. It is a manual irrigation method where water is directly taken out from the wells with the help of pulley and is used for irrigation. 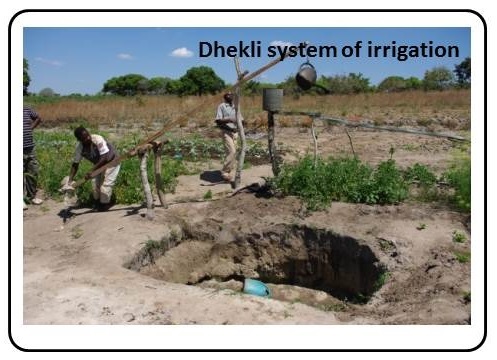 Dhekli system of irrigation – Here, a rope and a bucket are connected to pole to obtain water from the well. The rope and bucket is connected to one end of a heavy stick at one end and a heavy counter weight at the other end. 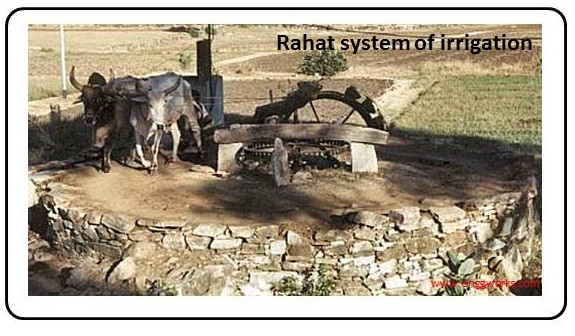 Rahat system of irrigation: By this method, water is drawn out of the well with the help of animals. Animals like cow, buffalo, ox are connected to the wheel and when the animals move, the wheel draws water from the well. 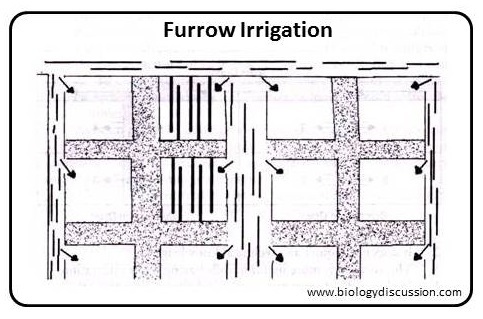 Furrow Irrigation: Here, the water is allowed to pass into the field through a furrow or channels made between two rows of the crop. Basin Irrigation: Here, the filed is just filled with water as in the case of paddy crop. Sprinkler System: This consists of a network of perpendicular pipes having rotating nozzles at their top. These pipes are joined to the main pipeline at regular intervals. Water when flows through the main pipe under pressure, it escapes from the rotating nozzles. 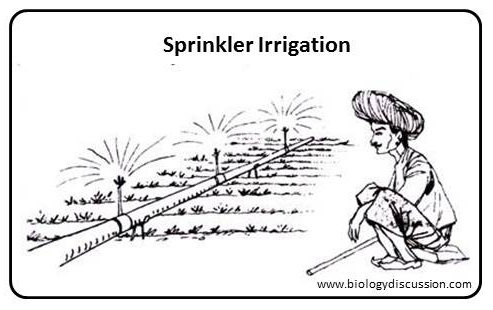 As a result, water gets sprinkled on the crop (similar to how rains occur). 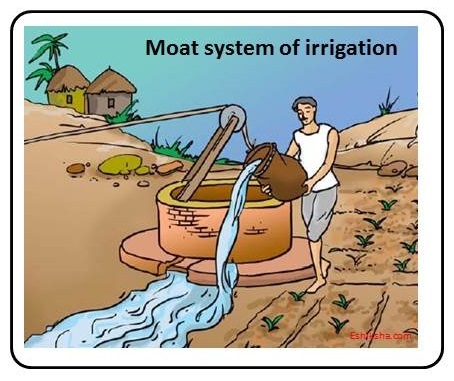 This system works better on the uneven land where sufficient water is not available or where the soil cannot retain water for a long time. 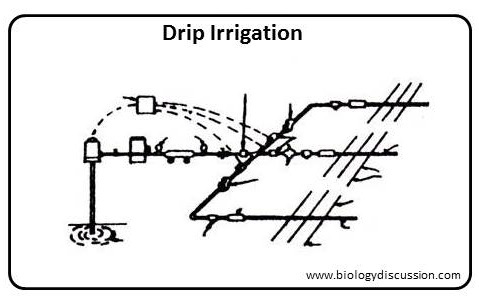 Drip System: As the name suggests, this system provides water drop by drop at the position of the roots (at the root zone). 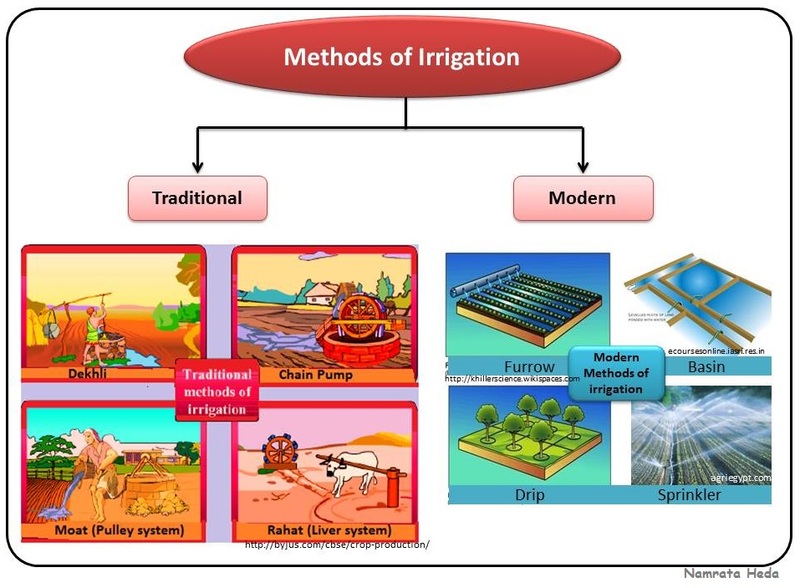 It is also called trickle-irrigation or micro-irrigation. This is the best technique to water fruit plants, gardens and trees as water is not wasted at all and is very efficient. 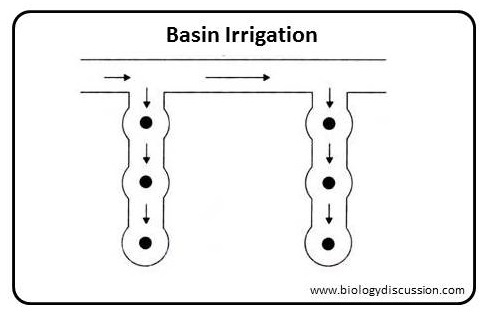 All crop plants require water at some or the other stage of development. And it is necessary to provide right amount of water at the right time. 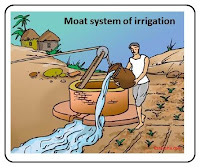 Excess of water may cause waterlogging in the soil which in turn, will inhibit the germination of the seeds as seeds will not get sufficient amount of air to respire. Waterlogging also causes poor growth of the roots. The fully matured crop, when irrigated, gets damaged. The plants which are not able to resist the strong winds and excessive water, fall down. This falling down of the crop due to untimely irrigation is called lodging and this affects the yield of the crop. This is in reference to the CBSE class VIII Biology.